It is now mid-July and I am overdue for my summer home decor refresh! Unfortunately Portland has not been the most summer-y this season, hence the delay. I guess I will just have to bring warmth into my life through my color scheme! My downtown loft is a bit of a masculine space with its dark metal staircase, concrete support beams, and vaulted ceilings. As you may know, I love design concepts that balance masculine and feminine elements. 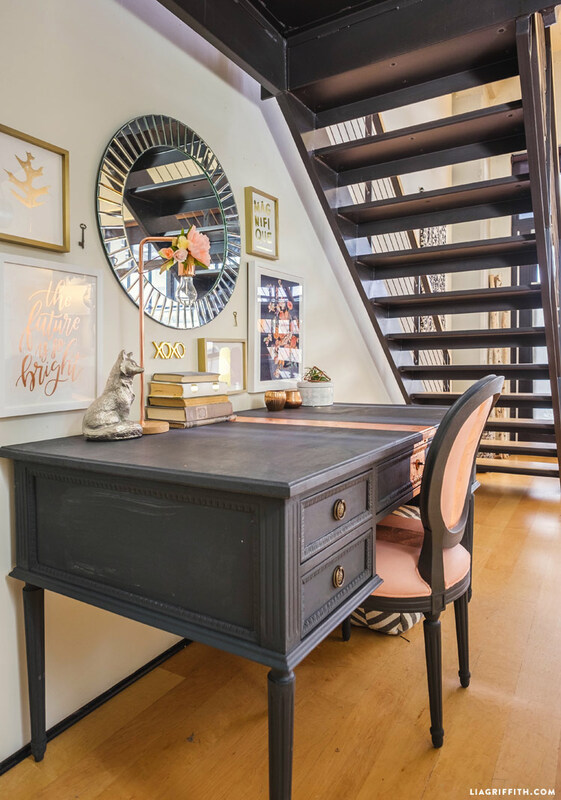 In order to add a warm, feminine touch to my cold, industrial loft, I added blush pink and gold as my main accent colors. Pink is not generally my color, but I do have to say that pink has been very trendy in home decor lately. Plus it matched perfectly with the raw wood furniture that I recently finished. 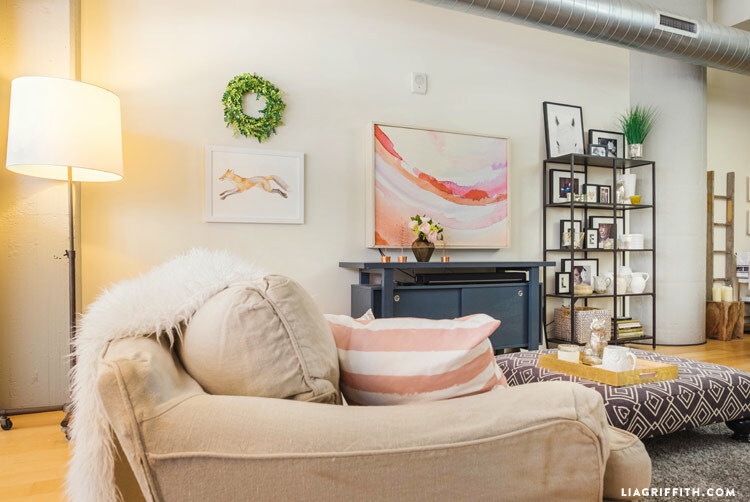 I picked up all of my home decor accents through Minted, an online marketplace that allows you to customize specific pieces to fit the exact spaces you are looking to fill. Find the designs that you like, and then personalize that design in a whole array of colors and sizes to match your decor. It is so convenient! Minted also features the work of a lot of independent artists, and I love being able to support that effort. For my specific summer home decor, I knew I wanted to incorporate art pieces and pillows as my pink accents. 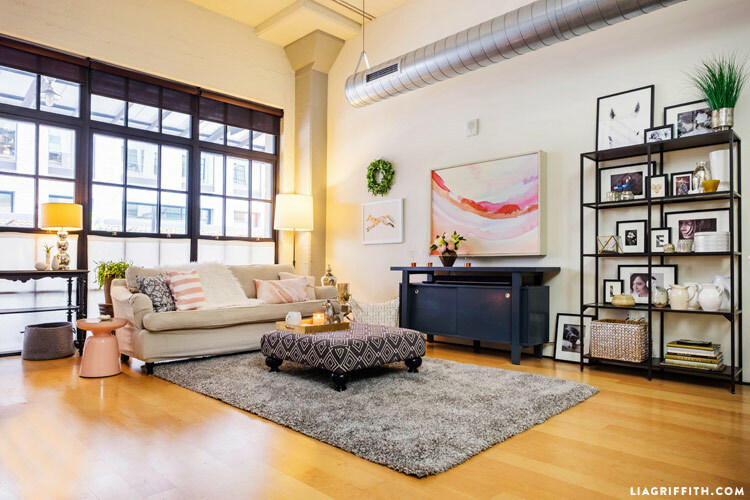 I created my own curator page that includes the pieces that I chose for my loft, plus lots of other pretties that I fell in love with for you to browse! Because the ceilings in my loft are vaulted, I have tons of wall space that I was looking to fill. Minted has a beyond fabulous selection of wall art, which you can order with or without a frame. 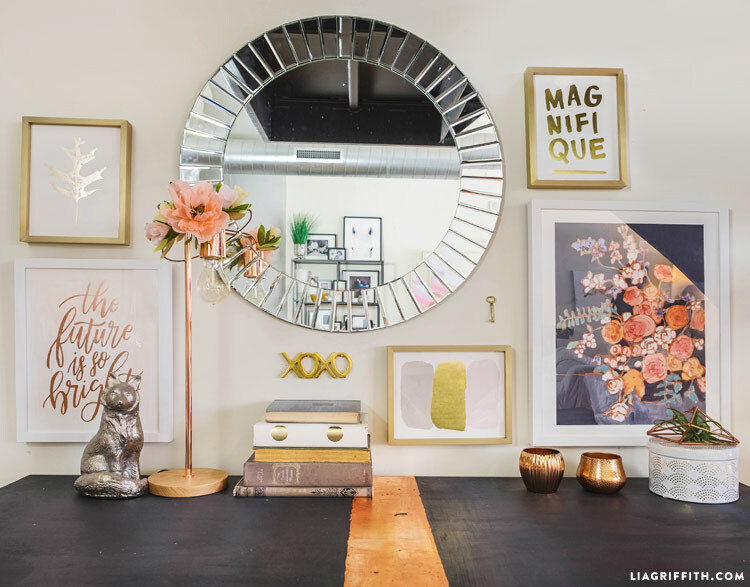 I started by accessorizing the space above my desk with the Bright Art Print, Magnifique Art Print, Reach Art Print, Sitting Pretty I Art Print, and the King of the Forest Art Print with gold and white frames. The metallics in these pieces looked wonderful paired with my circular mirror in the center of the display. Moving on to the living room portion of my summer home decor, my goal was to cover the space with inviting pillows. With each pillow design on Minted’s site, you can choose either a square pillow or lumbar pillow. 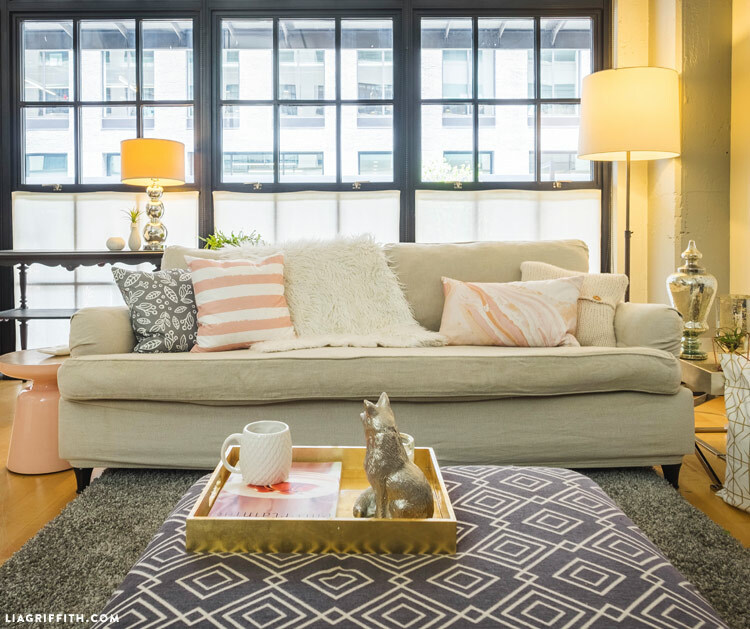 I outfitted my couch with the Chunky Stripes Square Pillow in petal, Painted Florals Square Pillow in grey, Iron Gate Square Pillow in copper, and Modern Marble Lumbar Pillow. For each pillow, you can also choose the type of fabric that you want. Talk about freedom! I went with the linen-cotton blend to have a light material for my summer home decor. My favorite part of my summer home decor has to be the large statement piece Come Together Art Print in the center of my living room. 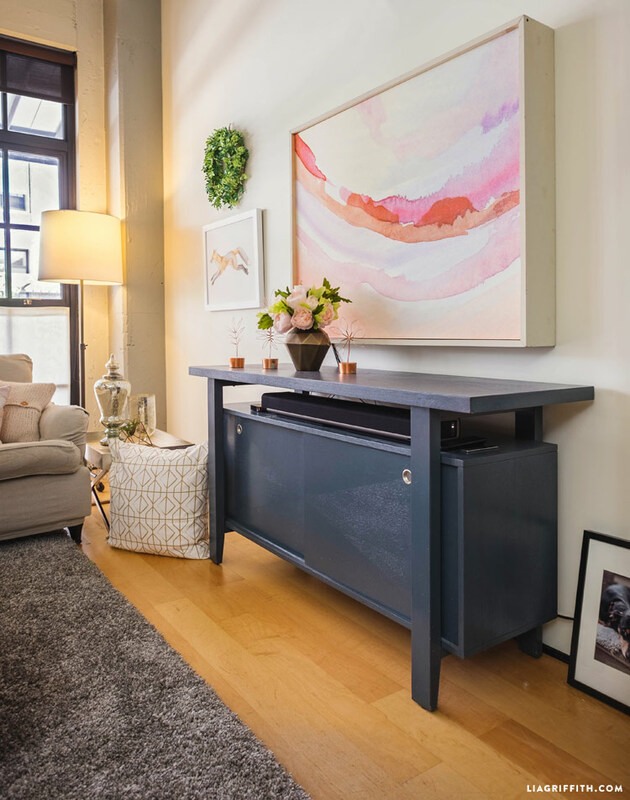 Not only is it a gorgeous art piece, but it is actually a DIY TV cover! I have a tutorial to make your own DIY TV cover here. I took this piece down to my local framers, and they created a mount that would fit perfectly over my television. I added my final touches with the Swift Fox Art Print and the Snow Ready Art Print. Somehow I managed to miss that you had moved from your gorgeous Craftsman house – I loved that house! It is no surprise, though, that you have made another lovely home in your new loft. What an amazing space and what enviable windows! I really admire the way you don’t just import your previous look to a new space but alter and adapt to the new surroundings. 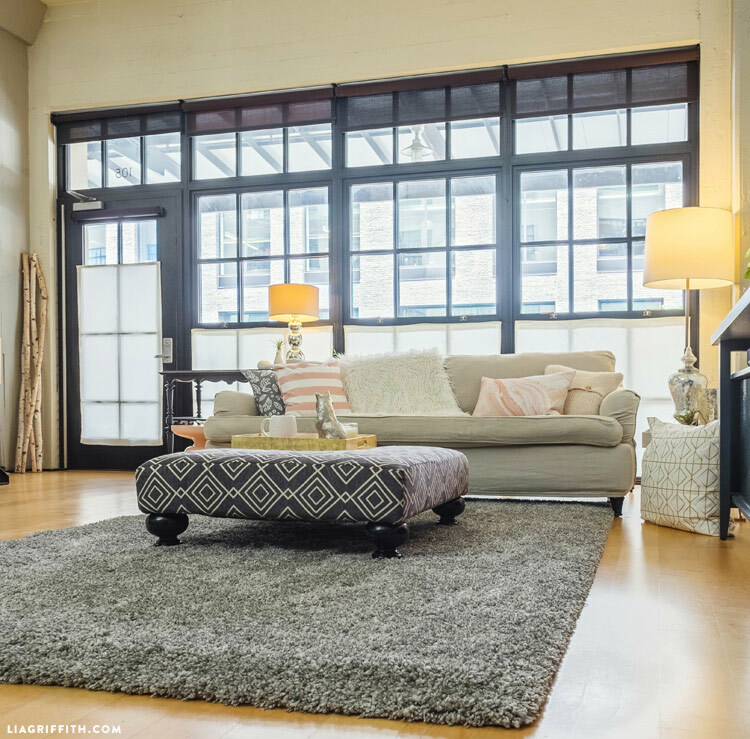 Your choices have certainly brought out the warmth and femininity in your once ‘industrial’ loft and it now looks so comfortable and inviting. Those touches of pink are genius. I may be a bit late with my ‘new home’ greetings but nonetheless I wish you santé et bonheur – health and happiness. Thank you Deborah, your comment really made my day! Knew you had excellent tastes and style Lia. I enjoy seeing other people’s styles and what makes them happy to live with those tastes and styles. I like to find individual things of somebody elses’ ideas to see if I can incorporate any of them into my style for something different in my life, try it out. I don’t think what I prefer now will always be what I prefer, like to have different concepts to experience, see if it’s something would be good in my life, improve it. Sorry your weather hasn’t been summery this year.